The PSiO is a pair of glasses equipped with small earphones and chock full of high-tech electronics that use MP3 files to play synchronised sound and light stimulation programs to which music and voice guidance are sometimes added. What technology does the PSiO use ? The technology is based on a very simple principle: distracting attention which is the source of stress and rumination, to lead users on a kaleidoscopic journey at the edge of sleep. Never falling asleep, users are gently propelled into a state of consciousness similar to dreaming which has been known for over a half-century for its benefits for memorisation and information processing. This makes the technique popular with students and people who are required to make intense mental efforts and it is effective for all types of heavy fatigue resulting from jet lag and sleepless nights, among other things. The power of suggestion is optimal at the edge of sleep: it's the best time to take advantage of calming, themed suggestions on a wide range of targeted applications ! The technology used in the PSiO is a combination of coloured stimulation and pulsating beats at very precise frequencies, sometimes combined with binaural beats and with relaxing music and suggestive voices that at times enter sequentially and at other times in multi-evocation (that is, simultaneously) using the method developed by Dr Milton Erickson, the creative genius behind indirect suggestion. The texts of the recorded messages are written by doctors specialised in psychosomatic medicine. The speakers are professionals experienced in sophrology and suggestion. 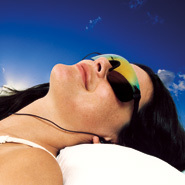 The music is developed in collaboration with musicology and relaxation specialists. 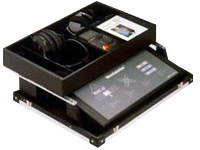 This is an audiovisual stimulator designed for use by members of the medical profession. This model is used both in operating theatres and in sleep laboratories.